I just found the funniest thing. It’s this series that Wired Magazine is doing, where actors answer the most googled questions about themselves. I just watched one with Will Ferrell and Amy Poehler. (video below) I am kind of in awe of people who can spitball like these two can. They are improv geniuses. But on to today’s recipe. We’re going to make low carb jam out of berries, sugar-free sweetener and Jello. This is a low carb take on a recipe for Rhubarb Raspberry Jam that I found in the Better Homes & Gardens Cookbook. Rhubarb is only in season for a brief period of time, so I’ve changed the recipe to include blueberries and blackberries instead. 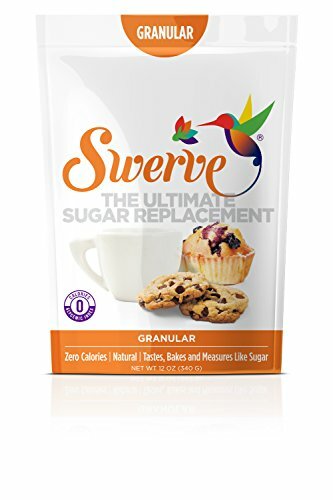 When I substituted in sugar-free sweetener and Jello, it lowered the carb count to just 1g per tablespoon. Normal sugary jam has around 13g carbs per tablespoon, most of which is pure sugar. So this makes for a great healthy alternative. This berry jam is great on low carb waffles and pancakes. And it’s terrific on low carb breads like cloud bread, psyllium bread and even low carb yeast bread. You can also use it in fruit filled cookies like these ones. Yep, this Jello jam is good on just about anything. This recipe is a very easy to make jeam that you make using berries and Jello. And each serving has just 1g net carbs. 1. Wash the berries well, then mix the berries and sweetener together in a large bowl. 2. Allow the mixture to sit for 15 minutes. 3. Add to a large pot or saucepan and cook over medium high heat for 10 minutes, until all the berries have broken down and released their juices. 4. Mash the berries with a potato masher. 5. Add in the Sugar-Free Jello and Knox Unflavored Gelatine and mix to dissolve. Test for sweetness and add more sweetener to taste. If you liked this low carb Jelly recipe, then you might like my recipes for Raspberry Rhubarb Jam, Raspberry Chia Seed Jam and Mock Apple Butter. It looks so fresh and tasty. Can’t wait to make it at tonight.